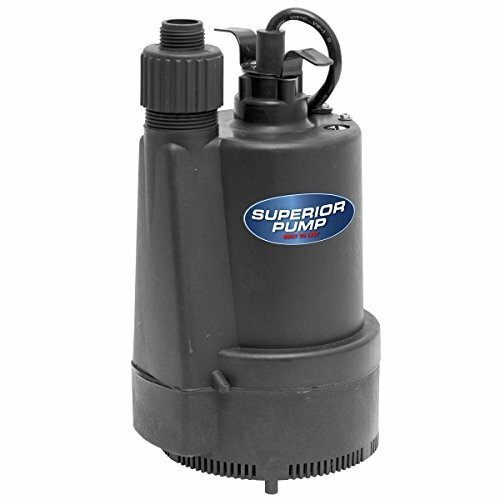 The Superior Pump 1/3 HP Submersible Thermoplastic Utility Pump offers exceptional power in a small, durable frame. Able to pump 40 gallon a minute up to 25 feet of vertical height, this Fully Submersible pump can easily fit inside a 6 in. opening. Designed to drain standing water from any environment, the 91330 is ideal for flooded basements, farm use, draining standing water from swimming pools, fountains, flooded basements, typical residential or commercial water transfer applications, and will pump down to a 1/2 inch The 91330 features a continuous-duty, split capacitor motor for optimal performance. Thermally protected, the high-efficiency, 4.1 Amp, 1/3 HP motor delivers the power necessary for any tough job. Durable thermoplastic construction ensures this submersible pump can be used time and again without corroding. Water intakes on the side and bottom of the pump allow for continuous pumping with clog-resistant suction. The pump features a 10 foot, replaceable, waterproof power cord and is equipped with a large 1-1/4 inch male iron pipe discharge thread for high capacity pumping. A 3/4 inch garden hose adapter is also included. UL/CUL listed and CSA certified and backed by a one-year limited warranty. An optional float switch (sold separately) can be added to allow this model to be used as a sump pump. If you have any questions about this product by Superior Pump, contact us by completing and submitting the form below. If you are looking for a specif part number, please include it with your message. Lubegard 63016 Platinum Universal ATF Protectant, 15 oz.